Chinese Navy (PLAN) Commissioned its Fourth Type 052D Kunming-class Destroyer "Yinchuan"
According to the People's Liberation Army Navy (PLAN or Chinese Navy) the fourth Type 052D (NATO reporting name Luyang III class) destroyer Yinchuan (hull number 175), was just commissioned on July 12 with China's South Sea Fleet. The vessel is now homeported at Yulin Naval Base located in the Yalong Bay (city of Sanya) on Hainan island. 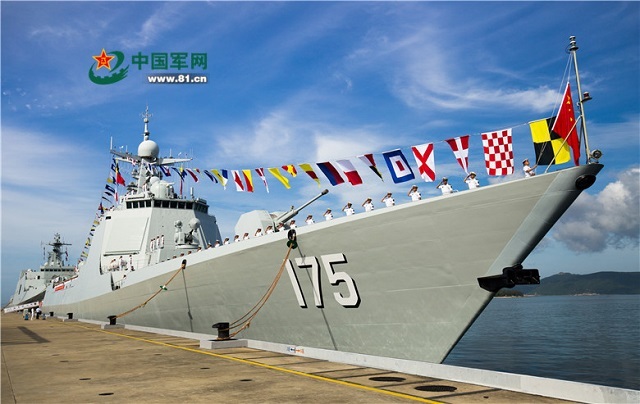 Type 052D Destroyer Yinchuan (175) was commissioned on July 12 according to the PLAN. The first vessel of of the class, Kunming (hull number 172), was commissioned in March 2014. Changsha (hull number 173) , the second Type 052D Destroyer to join the PLAN, was launched just four months after head of the class Kunming but was commissioned much later, in August 2015. Hefei (hull number 174) was launched at the Changxing Jiangnan naval shipyard near Shanghai on July 2nd 2013 and was commissioned in December 2015. At least 12 Type 052D Destroyers are expected to be built for the PLAN, most of them (80%) by Changxing Jiangnan naval shipyard near Shanghai (the rest at Dalian shipyard in North East China).